Is the food industry guilty of a similar trick with their ‘clean label campaign? In Joanna Blythman’s new book, ‘Swallow This’ (a read that is fascinating and scary in equal measure) she looks at whether the food industry is improving or simply rebranding. When consumers became fidgety about e-numbers, additives and food colourings the industry decided they needed to react to this pressure. But have they really improved our food? On the face of it yes. 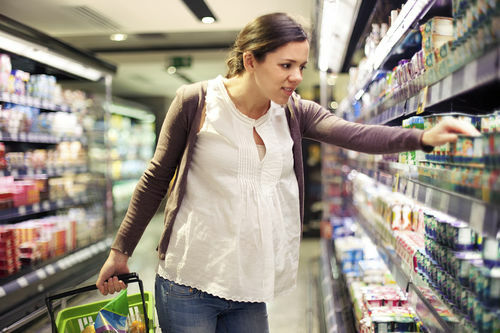 Shoppers are reassured by ‘no artificial colours or flavourings’, ‘no added sugar’ etc. Even the most conscientious consumer who reads the small print on the back will no longer find a long list of e-numbers or the dreaded trans fats listed, instead there is the more palatable ‘modified starch’, ‘natural colourings’ etc. However what is behind this change, according to Joanna, is not a more natural approach to food production but closer to a PR exercise. In reality there is now just a different set of industrially produced ingredients, processing aids and enzymes that are potentially no safer than the E-numbers that they replaced. Manufacturers do not appear interested in the nutritional qualities of the food they produce. Everything is about initial look or taste, of ‘appearing natural’ or ‘fresh-like’. Even if there is nothing intrinsically wrong with using these ingredients their existence is to make the process cheaper and means there is lot less of real and nutritious ingredients like butter, nuts, flour, dairy and meat. Processed food is not ‘food’ anymore but ‘complex constructions of high-tech ingredients’. Unfortunately there is no reassurance for those of us who like to think we have escaped the problem by avoiding the obviously heavily processed foods such as cheap biscuits and cakes, ready meals and packet sauces. Joanna’s research covers food that even the most diligent parent would have in their shopping basket – bread, premium yoghurts, frozen vegetables, chicken, sliced meats and ready prepared fruit and vegetables. What surprised me the most was what manufacturers are allowed to use as a ‘processing aid’ and not include on the label. How often have you picked up some ready prepped vegetables or a fruit salad, assuming that they are in their natural state? Would you think that they had been treated with enzymes to look fresher and firmer in their pack? How about when you consciously avoid all the pre-packaged biscuits and decide instead to treat yourself to something from an in-store bakery, would you dream that it might have been pre-prepared months before and then left frozen on shelf waiting to be finished off on site? Hearing that I didn’t feel reassured I felt patronised. Unfortunately for the food industry the age of people trusting large institutions to serve their interests is long gone! We mustn’t fall into the trap of thinking we shouldn’t ask tough questions about the food industry because we are not clever or scientific enough to understand the answer. The whole point of regulatory bodies and labels should be to make information accessible. We also shouldn’t be made to feel like we are being ‘difficult’ for wanting to know what is in our food! More on this subject and practical advice for families wanting to eat clean in further posts, coming next week.